Despite the influx of class 245s in 2015, the most prestigious trains on the München - Buchloe line were still worked by pairs of class 218 diesels in Spring 2016. Long may it continue! 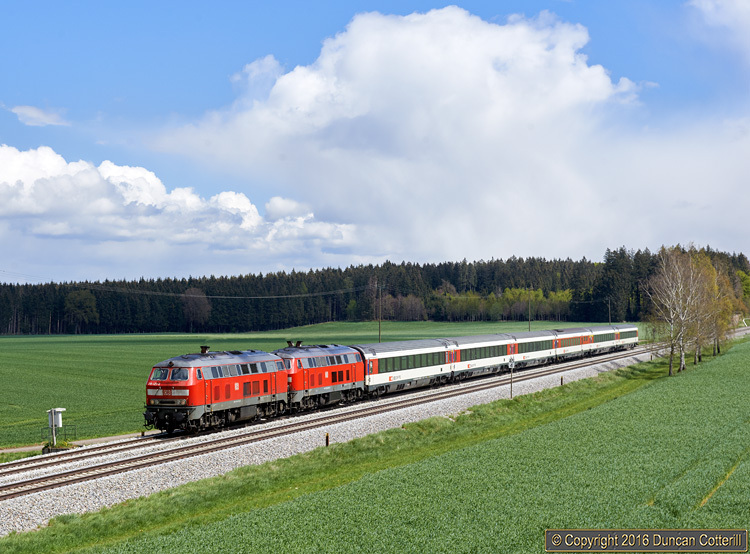 EC 194, the 12:33 München - Zürich EuroCity raced westwards behind 218.423 and 218.426 in glorious light on 25 April 2016. Although the weather at Schwabhausen, 3km west of Geltendorf, looked pleasant, the cloud in the background had been pelting the area with hailstones until a few minutes earlier and the next one wasn’t far behind.